Here’s something you could have seen coming from a mile away: Tesla is making a performance version of its much heralded Tesla Roadster. What makes the Sport version so different? The Roadster Sport has a hand-wound stator that increases winding density helping to eliminate resistance while increasing peak torque (i.e. more power). It also gets better tires. Yokohama Ultra High Performance tires in this case (people are speculating they will be the same Advan A048s fitted to Lotus’ Elise/Exige). 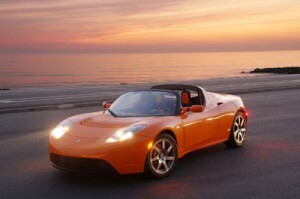 The 0-60 time of 3.7 seconds is 0.2-seconds faster than the standard Roadster. The Tesla Roadster Sport also gets Lotus-derived components, including adjustable dampers and anti-roll bars that can be tweaked to suit the driver’s tastes. Neat, right? Now the real question: How much? The starting price is $128,500 in the US and €112,000 (excluding VAT) in Europe, or $28,000 more than the base model of Tesla Roadster. It’s up to you, the buyer, if that is worth it. More Sportier BlueMotion Models From VW?